The scrapbook and timeline are multiliteracies teaching tools designed to introduce Grade 10 Academic Canadian History students to the residential student system in Canada. 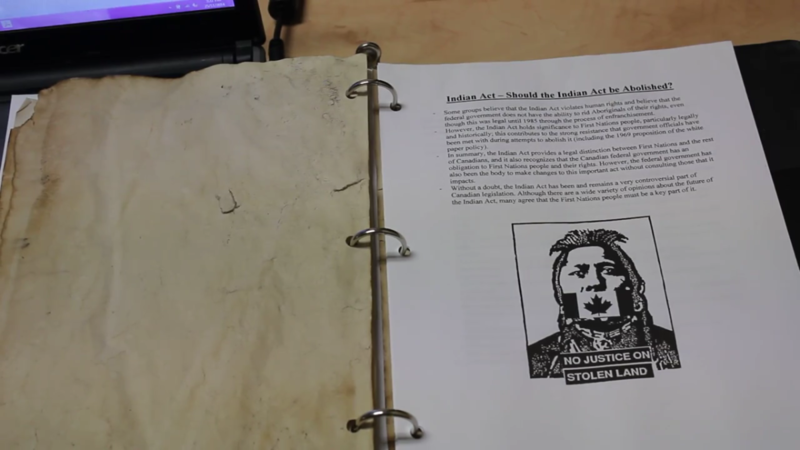 The scrapbook provides an introduction to the Indian Act and many specific aspects of the school system from its beginning to its end. Ideally, students would work in groups, and each group would have a copy of the scrapbook. The timeline highlights key dates and events throughout the system. The attached lesson plan also introduces some of the resources that can be used throughout the unit. The files to assemble the scrapbook follow the video. CURRICULUM EXPECTATIONS: A1. Historical Inquiry: use the historical inquiry process and the concepts of historical thinking when investigating aspects of Canadian history since 1914. The activities in this lesson use a variety of different instructional strategies, including those that will appeal to students who enjoy using reading, writing, listening, visuals, movement, physical objects, technology, group work, and independent work at school. The activities can be altered to accommodate the learning needs of all students in the class: for example, students who need extra time to complete the written response can be given class time the next day to complete it, and any students who needs extra help or clarification will be given it. Students also have the advantage of having a physical learning tool (the scrapbook) that they can hold, look through, and revisit as often as necessary and at their own pace. All group work and independent work that the students do will be assessed informally for comprehension during the class. The teacher will also collect the written responses and exit slips. These pieces of written work will not be formally evaluated but will also be assessed to find out what students learned from the first lesson, what they struggled with, and what can be improved for future lessons in the unit. They will prepare students for future assignments that will be evaluated, such as the timeline group assignment (once it is completed and presented at the end of the unit) and other written work. Students will continue to learn about residential schools in Canada for the rest of the week. They will continue to use the scrapbooks in their table groups and will build on their timelines each class with their groups. The “Scrapbook on Residential Schools in Canada” project is a teaching tool that embodies the key ideas of multiliteracies. It incorporates writing, images, and a physical object to create an interactive multimodal lesson that can be adapted to students’ learning needs. Unlike a PowerPoint presentation, the scrapbook works at a pace with which the students are comfortable. As stated in Content Area Reading: Literacy and Learning Across the Curriculum, literacy involves critical engagement with a variety of texts, not just traditional printed material (Vacca, Vacca, and Mraz 32-33). Students can turn forward or back in the book and stop on certain pages for as long as necessary. Keeping with the idea that literacy being is more than basic reading and writing, the project incorporates technological literacy as well: it comes with a digital timeline component that can be viewed online. In addition to being a visually-appealing pedagogical tool that students can manipulate, the scrapbook incorporates texture through a few rough, yellowed pages. Students can touch pages that have been aged and imagine the time period in which the real documents existed. Only pages dealing with old legislature have been aged, allowing students to explore the contrast between the faded, wrinkled pages and the new white papers. Through discussion, the students will recognize that aging only certain pages is intentional; the distinct contrast between the pages demonstrates that the root causes of residential schools are embedded in the past, but the impact and legacy is as relevant as the new papers. The aging of the pages, then, has both a meaningful pedagogical purpose as well as a useful creative function. The topic of residential schools allows for students to discuss social justice and racism. They will explore the reasoning behind the government’s actions as well as the impact of the school system on Aboriginal people. Students will engage in critical discussions regarding the morality and justification of the system. The lesson plan includes elements from Content Area Reading. The first part of the lesson is an Anticipation Guide in which students respond based on their beliefs about whether or not particular statements are historically true (Vacca, Vacca, and Mraz 188-189). As the book states, the questions in the Anticipation Guide “remain nondirective in order to keep the discussion moving” and ask for students’ opinions rather than limiting them to facts they may or may not recall from previous history classes (Vacca, Vacca, and Mraz 188). They encourage students’ interest in the topic and assess their prior knowledge in a fast-paced, game-like activity. A graphic organizer, a “visual [display] that help[s] learners comprehend and retain textually important information,” has been incorporated into the lesson plan in the form of a timeline (Vacca, Vacca, and Mraz 318). Students will organize the information they read in chronological order and will critically select the pieces of information that they decide are most relevant. Using critical thinking skills throughout their reading will ensure that students retain the maximum amount of information from the scrapbook. Finally, in future lessons using the scrapbook, students will discover more information about the residential school system in Canada using Internet Inquiries (Vacca, Vacca, and Mraz 52). They will research information on some of the documents in the scrapbook and will decide what important points are missing. They will present their findings to their classmates and will mention things that they still want to discover about the topic. Vacca, R. T., Vacca, J. A. L., & Mraz, M. E. (2014). Content Area Reading: Literacy and Learning Across the Curriculum (11th ed.). New York: Pearson. THIS LESSON HAS BEEN CREATED BY RISA HLYMBICKY, ANGELICA LACHANCE, AND RUXANDRA NAHAICIUC. 2014.